This blog post was contributed by Prof Angela Taylor reporting from China. 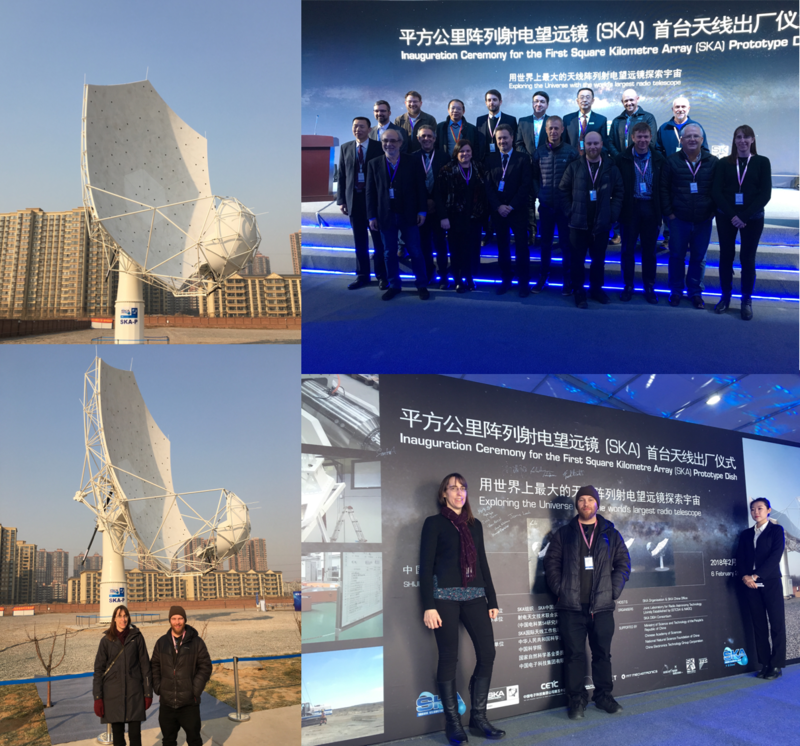 On Tuesday 6th February Dr Jamie Leech and I attended the inauguration of the first fully assembled SKA dish in Shijiazhuang, China. This is a major milestone for the SKA project. The 15-m diameter dish is one of two prototypes which will be tested ahead of production of an early array. In the first phase of the SKA project, 133 dishes will be deployed in the Karoo Desert, South Africa and will be equipped with receivers operating in the frequency range 350 MHz to 15.3 GHz. The team at Oxford is part of the international SKA Dish consortium that includes institutions in China, Australia, Canada, France, Germany, Italy, South Africa, Spain and Sweden. The Oxford team are leading the design and build of the high frequency receivers for the SKA dish which will operate from 4.6 GHz to 15.3 GHz. Clockwise from top left: SKA prototype dish (SKA-P); Members of the international SKA Dish consortium including Oxford members Prof Angela Taylor (front row, on far right) and Dr Jamie Leech (front row, 4th from right); Prof Angela Taylor and Dr Jamie Leech in front of the SKA-P dish; Angela Taylor and Jamie Leech after signing the participants board.